Jessica Wallisch, MD, a former T32 post-doctoral scholar in the Safar Center for Resuscitation Research, acknowledged her Pittsburgh-based research training and mentoring in an “ECI Biocommentary” in the journal Pediatric Research, published on January 19, 2019. Two pivotal mentors from the Department of Critical Care Medicine shaped Dr. Wallisch’s academic career: Dennis Simon, MD and Patrick Kochanek, MD. During her pediatric residency at UPMC Children’s Hospital of Pittsburgh, Dr. Simon mentored and fostered her interest in neurocritical care. Later during her pediatric critical care medicine fellowship, Dr. Wallisch thrived under the mentorship of Dr. Kochanek, a renowned neurocritical care expert and Director of the Safar Center for Resuscitation Research. 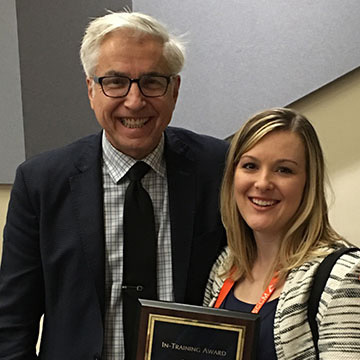 In her final year as a T32 scholar, Dr. Wallisch received the In-Training Award for the best paper submitted to the 2018 Society of Critical Care Medicine Congress in San Antonio. In addition, she was a co-author on a department-led abstract that won a Star Research Award at the Congress. Her research focuses on cerebral edema following TBI and cardiac arrest. Dr. Wallisch was a T32 post-doctoral scholar from July 2016 to June 2018. After her fellowship she returned to her roots in Kansas to take up a position as an Assistant Professor at the University of Missouri-Kansas City.